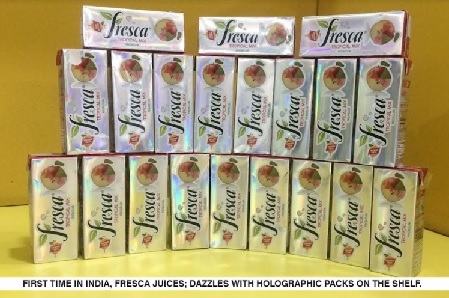 Fresca, leading and fastest growing Juice Brands has launched its juices in innovative holographic aseptic packs. The company has come up with 200 ml Tropical Mix and Guava juices in holographic packs in premium Juice category. Fresca becomes the first brand in India to bring out such packing. The Aseptic holographic pack used by Fresca is developed indigenously by Asepto, a Uflex limited company, as a global Innovation developed first time in India. Fresca is one of the leading and fastest growing Juice Brands of India. Fresca Juices has three manufacturing facilities with a strong presence in more than 10-12 states of India. With the aim of suiting the pockets and needs of buyers, the brand offers 11 flavors in sizes from 160 ml to 2 liters. With all the available price points starting from Rs. 10-120. “In India by far the Aseptic beverage packaging has had very limited aesthetic possibilities with not much uniqueness or exciting visual hook on the shelf to offer to the consumers. However, the unique striking effects of holographic innovation by Uflex’s brand Asepto has encouraged brand like us to create a fresher approach to consumers, the holography in aseptic packs is a boon to the industry. On the first day of market launch we have been able to bag massive orders for the upcoming festive season.” added Gupta.